There is plenty of car parking a level 3 minutes walk away. Joan Pressley Hats is located in St Johns Alley in the centre of Devizes. 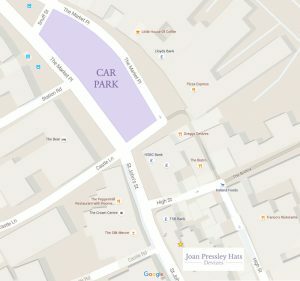 The entrance to St Johns Alley can be found between Hunter French Estate Agents and Giddings Wine Merchants & Delicatessens close to the town hall.